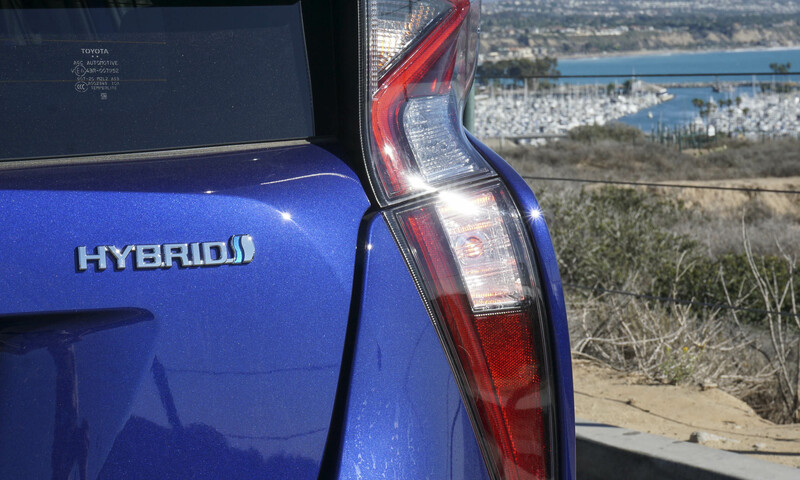 We’ll come right out and say it — we’ve never been fans of the Toyota Prius. 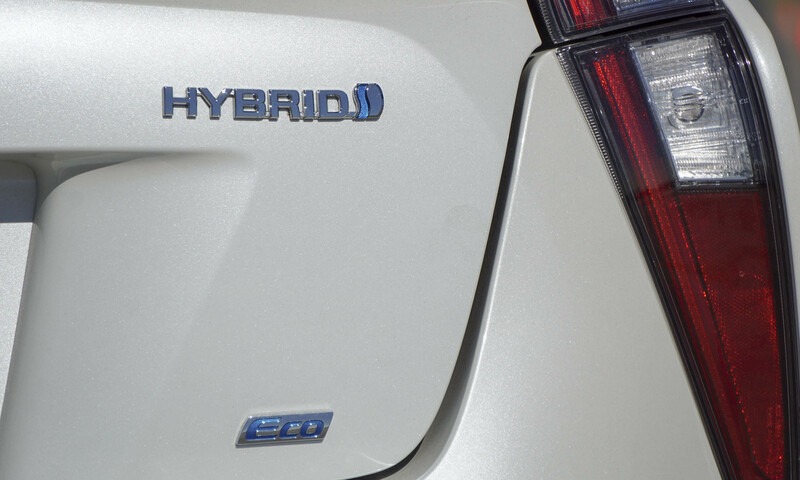 One of the first hybrids available in America, the Prius delivered on promised fuel savings, but as an everyday vehicle it didn’t do anything else particularly well. But after spending time behind the wheel of the all-new 2016 Prius, it’s clear that this new version does much more than just save fuel. The iconic hybrid has been completely redesigned and is built on an all-new global platform. 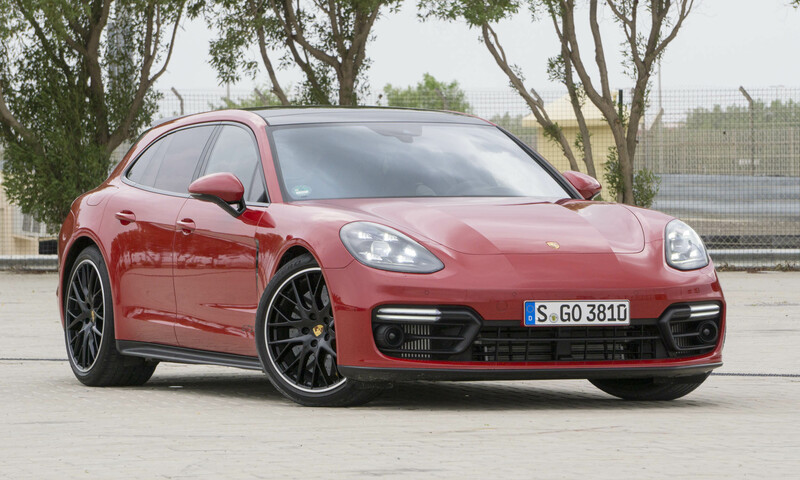 It has more futuristic styling with sleek lines and sharp angles, handling is greatly improved and fuel-efficiency is even better than the outgoing model. Overall, the new Prius is better in almost every way. There are four different versions of the 2016 Toyota Prius that offer different levels of equipment: Prius Two, Two Eco, Three and Four. Engine and transmission remain the same in all versions, and aside from the Eco there’s no exterior badging to indicate trim level. 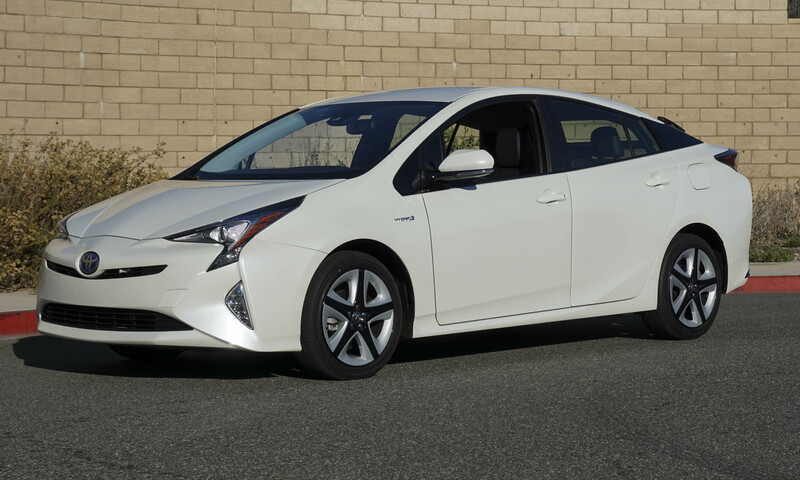 Prius Two has a base price of $24,200 — the same price as the 2015 Prius Two. 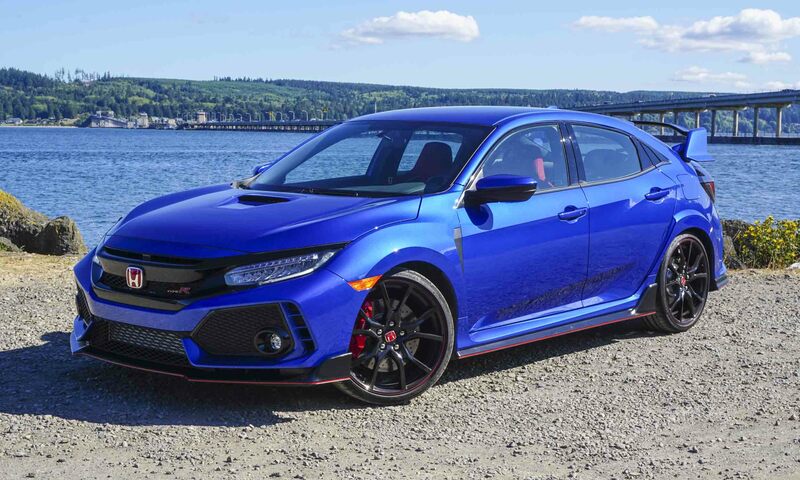 Standard features include automatic climate control with pollen filter, a backup camera, a 4.2-inch color display screen, digital instrumentation, push-button start, bi-LED projector headlights and 15-inch alloy wheels with full wheel covers. This entry-level Prius also comes with Toyota’s Star Safety System which includes stability control, traction control, anti-lock brakes and electronic brake-force distribution. Unique to the Prius Two is its nickel-metal hydride battery pack. 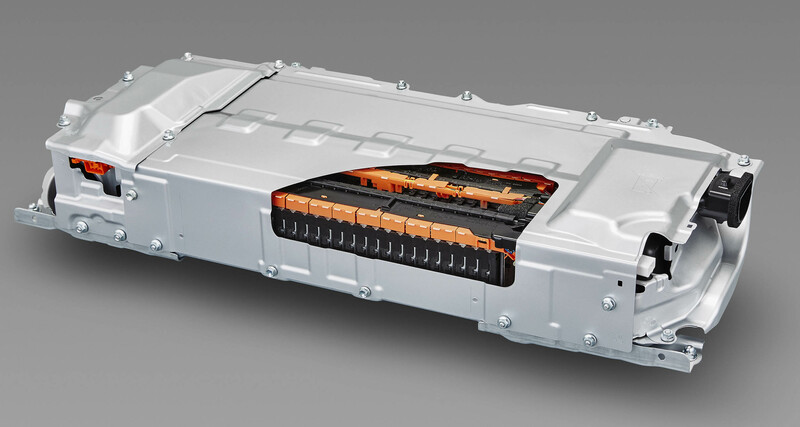 Although this battery is improved over the outgoing version, it is still larger and heavier than the new lithium-ion battery pack used in the rest of the Prius lineup. Toyota engineers explained that some markets are unable to dispose of the li-ion batteries, and since the car is sold worldwide there needs to be a version with nickel-metal batteries. 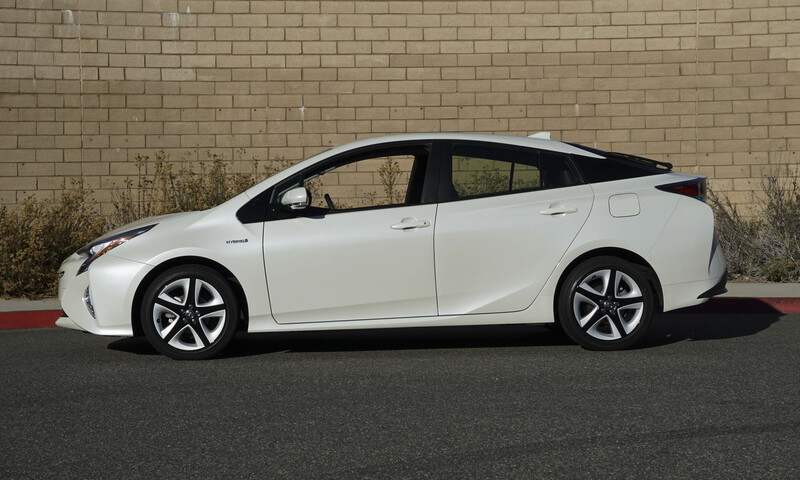 The Prius Two Eco carries the same features as the Prius Two but adds two-tone wheel covers and ECO badging on the vehicle’s tail. 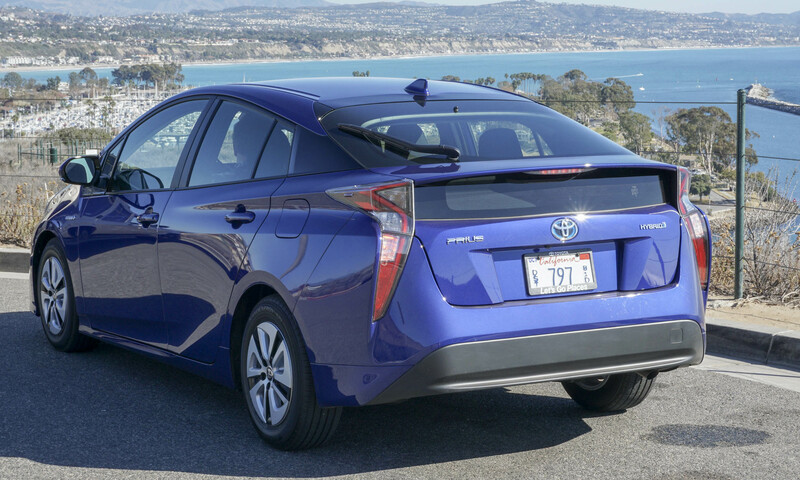 With the lighter lithium-ion battery pack and other weight savings, the Prius Two Eco is the lightest in the lineup and the most fuel-efficient Prius available. Prius Two Eco is priced at $24,700. 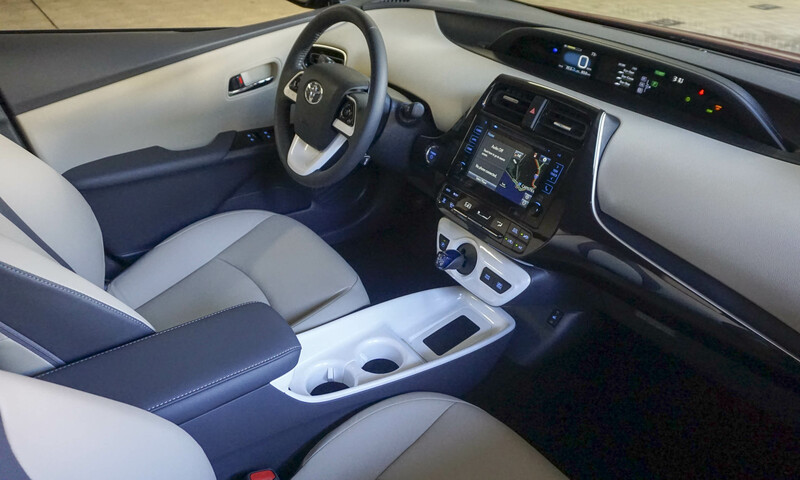 Priced at $26,250, the Prius Three upgrades the Two with a premium audio system, navigation, wireless smartphone charging in the center console and upgraded interior trim. The Three can also be equipped with an optional Advanced Technology Package that includes a head-up display, a power sunroof and Toyota Safety Sense. TSS features a pre-collision system with pedestrian detection, lane-departure alert, automatic high beams and dynamic radar cruise control. The top-level Prius Four is priced at $28,650 and adds rain-sensing wipers, heated front seats, an 8-way power-adjustable driver’s seat, a cargo area cover and a blind-spot monitor with cross-traffic alert. 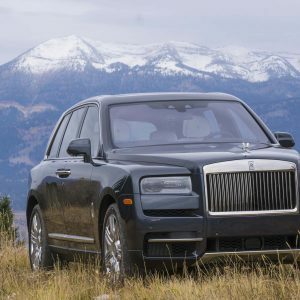 The Four also is available with the Advanced Technology Package, as well as a Premium Convenience Package that includes Intelligent Park Assist, Safety Connect and a premium JBL audio system. An optional Touring Package on the Prius Three or Four adds integrated fog lights, 17-inch wheels, unique bumper treatment and also includes Toyota Safety Sense. 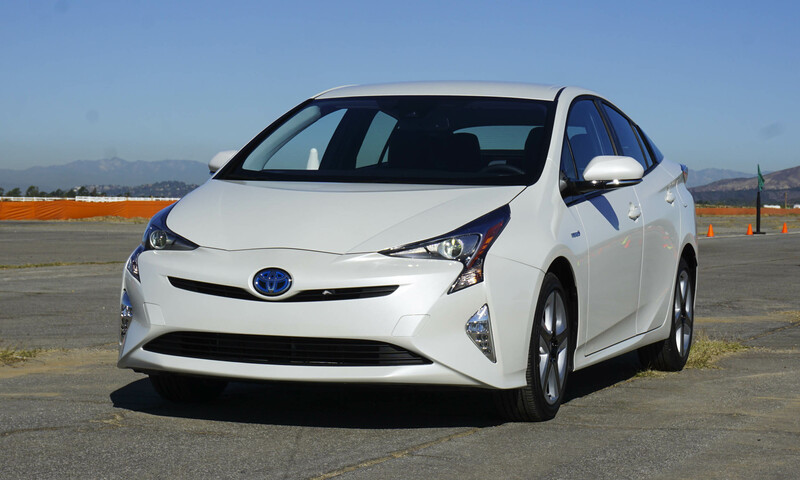 Price for the Touring Package runs $1,850 on the Prius Three and $1,350 on the Prius Four. 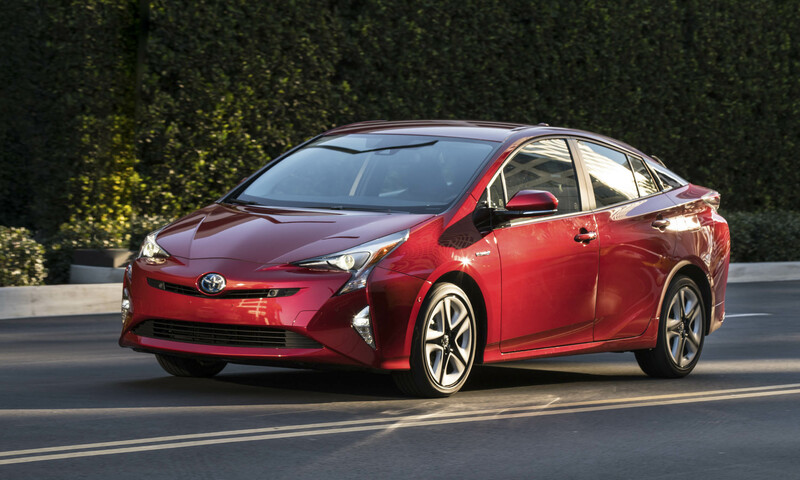 Powering the new Prius is a 1.8-liter Atkinson-cycle 4-cylinder engine combined with a permanent magnet synchronous electric motor. 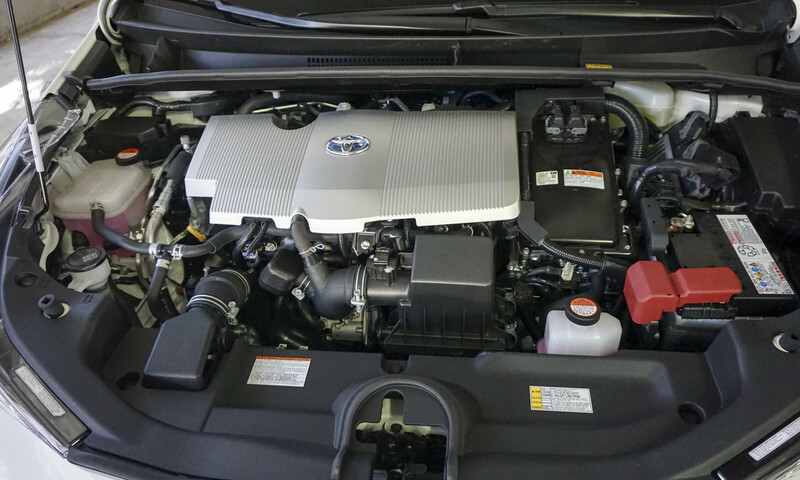 Combined output for the hybrid system is 121 horsepower. 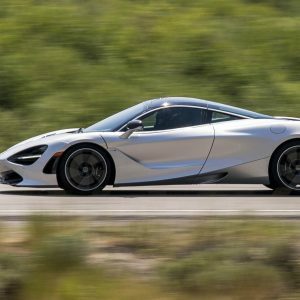 While the new model is rated at 13 horsepower less than the outgoing model, Toyota tells us they are using a new method of measuring combined horsepower and that the two are not comparable. 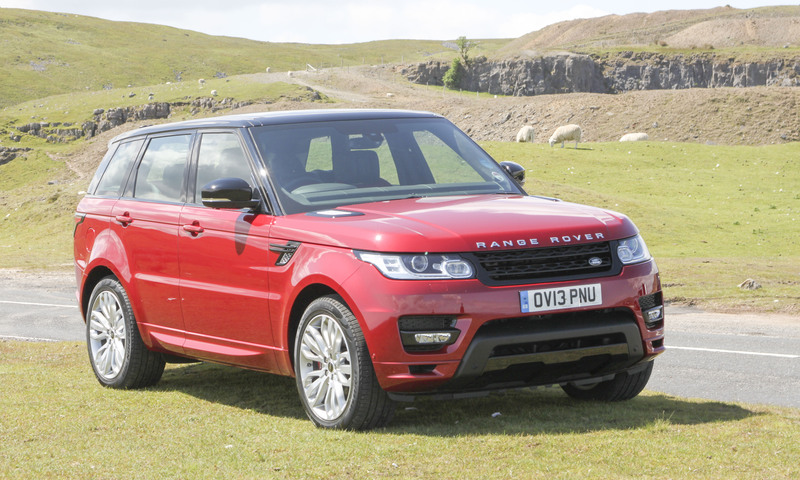 Power gets sent to the front wheels via a new electronically-controlled variable transmission. The new ECVT is smaller with reduced friction for better performance and fuel economy. Batteries are recharged via regenerative braking, which is great improved — the brakes no longer exhibit the “grabby” feeling of the earlier Prius. The Prius Two uses a nickel-metal hydride pack with 168 cells. Even though it’s the same battery type as the outgoing model, the pack has been reengineered to be slightly smaller and lighter. All other trims of the new Prius get electric power from a new lithium-ion pack which is 40 percent lighter and 38.5 percent smaller than the NiMh pack. 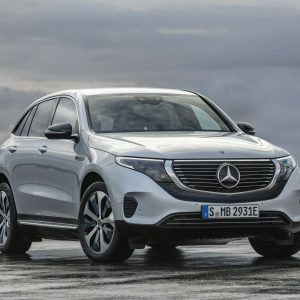 Batteries are now stored under the rear seat, which improves handling by lowering the center of gravity as well as providing better cargo space. The U.S. Environmental Protection Agency has not released fuel economy numbers for the redesigned Prius; however, Toyota estimates that the vehicle will achieve 54 mpg city / 50 mpg highway / 52 mpg combined. The Prius Eco, which is slightly lighter than the rest of the lineup, is expected to get 58 mpg city / 53 mpg highway / 56 mpg combined. Based on experience during our short time in the new Prius, these numbers might actually be conservative. The new Prius is longer and wider than its predecessor, which not only improves handling but also makes for a roomier interior. The redesigned seats are quite comfortable and supportive without being stiff. Leather is not available from the factory; however, SofTex imitation leather is soft and attractive with contrasting stitching. 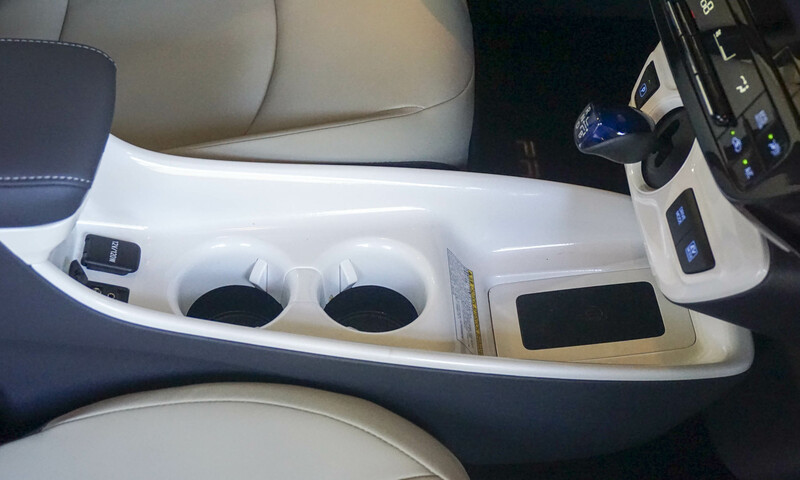 With the gear shift positioned on the lower dashboard, the uncluttered center console provides cup holders, a storage tray, power outlets and a padded storage box. The storage tray can be replaced by a wireless smartphone charger. In Touring trims the console is molded in white plastic, which doesn’t fit with the rest of the interior — it looks too much like porcelain. 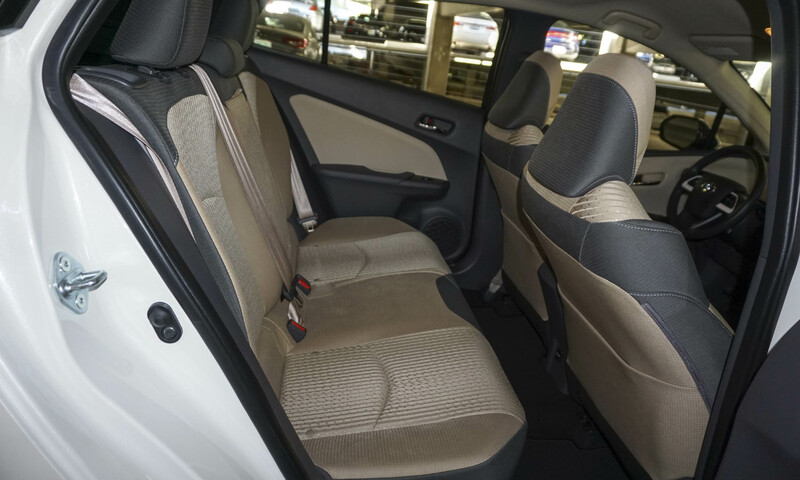 Rear-seat passengers have a surprising amount of legroom, even when the front-seat passengers are in a comfortable seating position. Putting three adults in back might be a bit tight but is definitely possible, at least for short distances. Cargo space is plentiful and easily accessible with a large rear hatch. 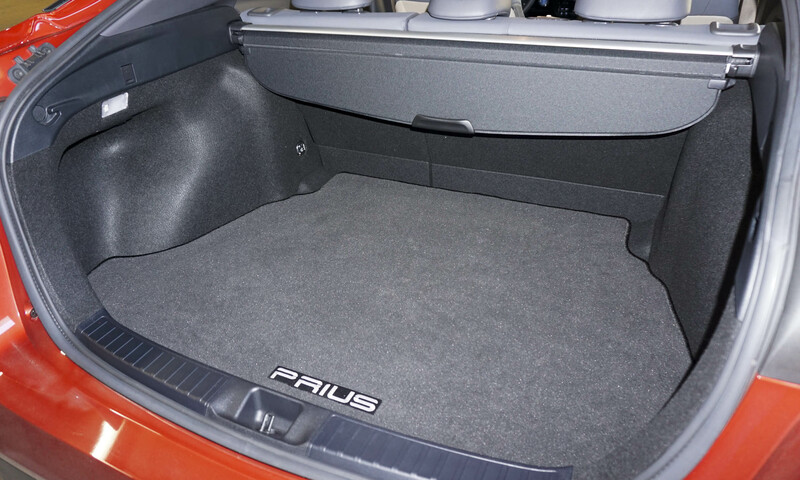 Prius comes standard with a built-in cargo cover that raises when the hatch gets opened; however, the Prius Four gets a retractable tonneau cover. Rear seats fold flat to handle larger cargo. 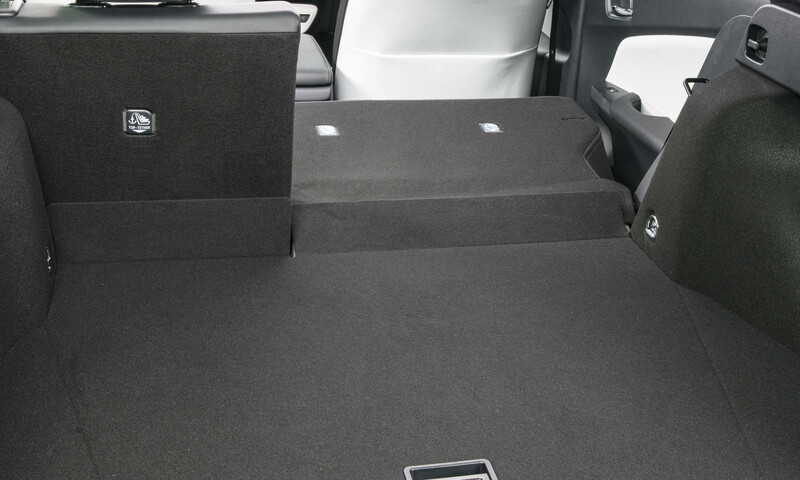 With the battery pack below the rear seats, the seat backs and cargo floor don’t quite line up, but the floor can be raised to create a flat load space. Although more space and updated styling are important, the way the new Prius drives turned us into fans. Sure, on paper the Prius has less power than its predecessor, but it definitely feels quicker and is certainly more agile — due in part to the new, stiffer platform as well as a lower center of gravity. 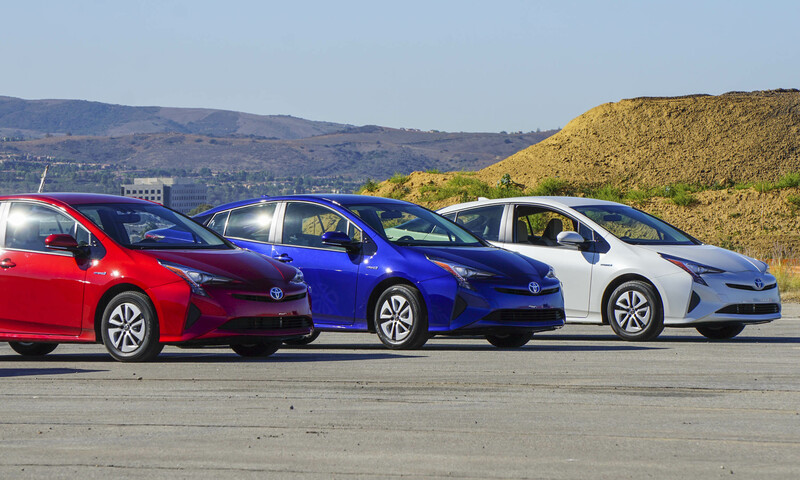 We had the opportunity to run through an autocross course in both the new and previous-generation Prius and the difference is striking. The new Prius felt lighter and turned in much quicker than the old version, which felt heavy and sluggish. 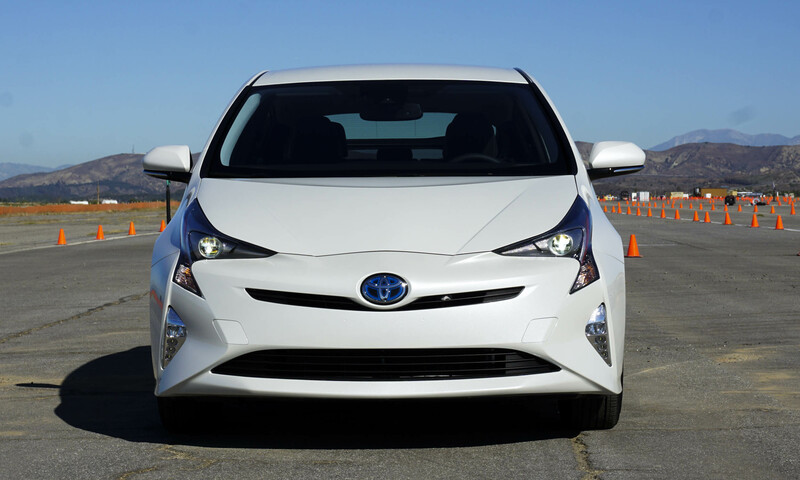 We wouldn’t go so far as to call the Prius fun to drive — but it comes close. 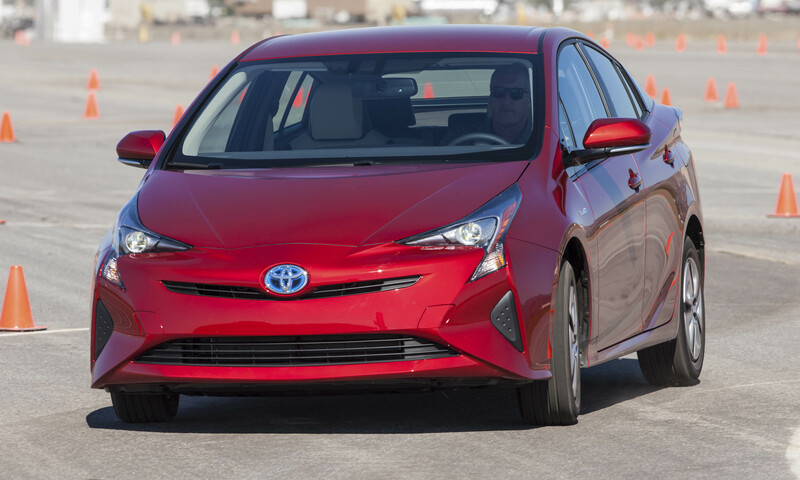 We also tested the Prius’s collision avoidance technology, which was able to automatically bring the car to a complete stop from about 17 mph before hitting an obstacle. 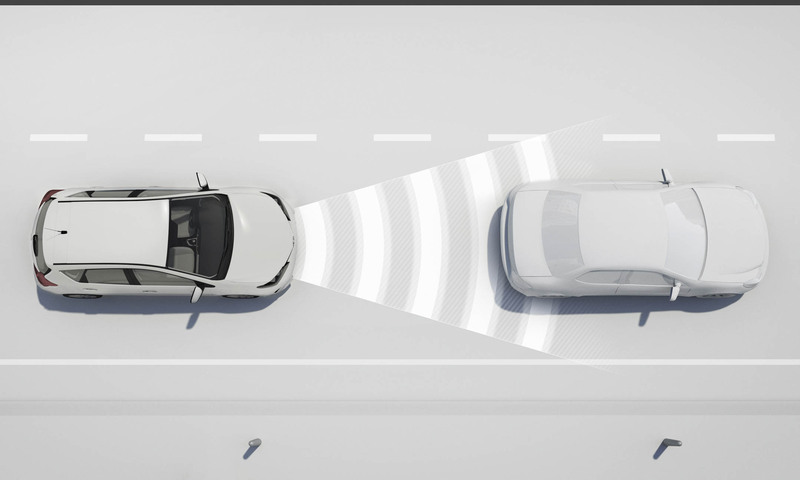 Impressive, however there are systems on the market (such as Subaru’s Eyesight) that can provide automatic collision avoidance from considerably greater speeds. 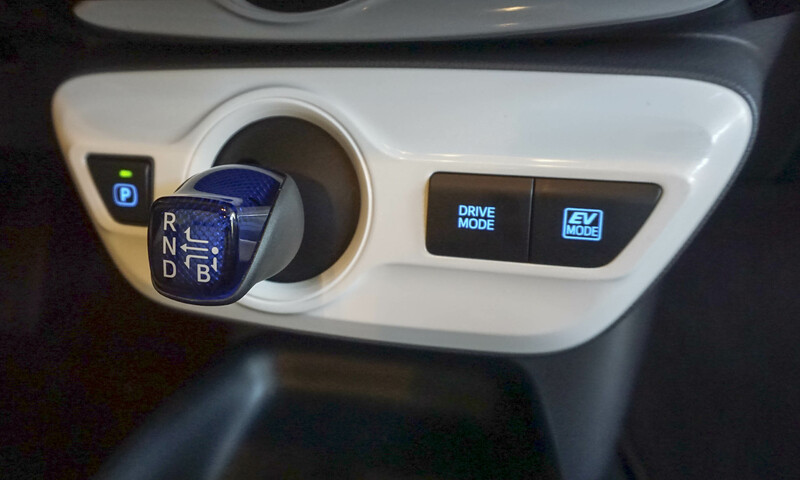 Toyota’s system also powers the adaptive cruise control that will maintain distance behind another vehicle all the way to a stop — another new feature for Prius. 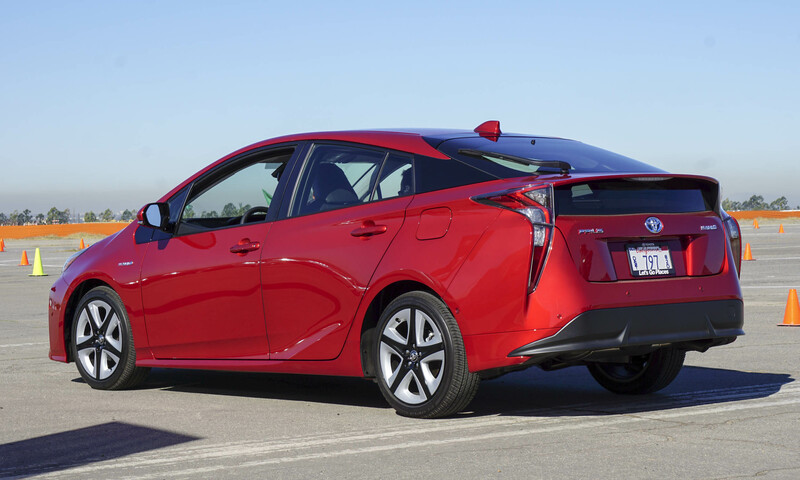 The new Prius feels much better on the road with better handling and performance, but high fuel economy is still the car’s main goal — and the new Prius delivers in a big way. 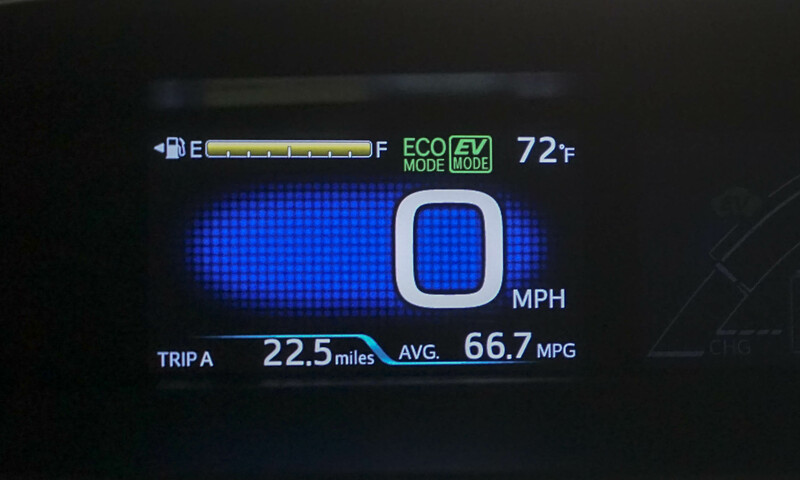 Without hypermiling or making any extra effort to drive the Prius any differently than a regular car, we saw close to 67 mpg in highway driving (in the Prius Eco). In a Prius Touring we pushed the car hard, averaging close to 75 mph on the freeway — yet we still came away with 51 mpg. In fact, we attempted to see how low we could get the fuel economy to appear in the trip computer, and the lowest we could achieve was 47 mpg — better than what we saw the last time we drove the older Prius. Prius can run about a mile on electric power alone. 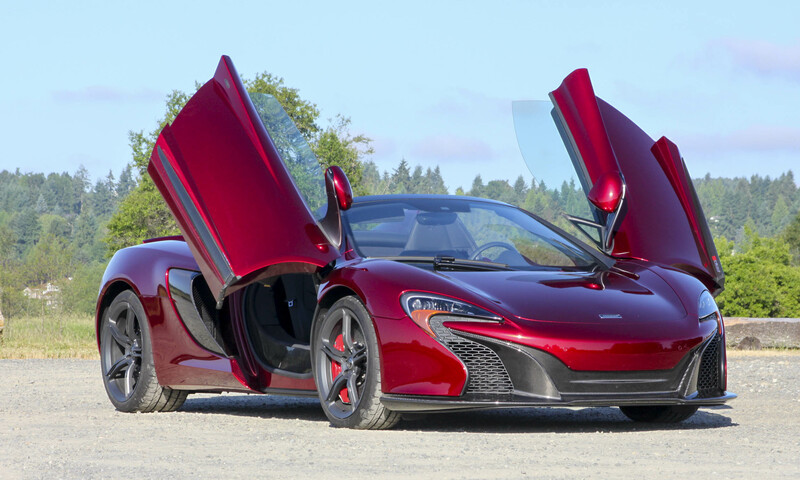 The car can also reach 25 mph without engaging the gasoline engine, and even at high speeds the gas engine will shut off when not needed. Prius will continue to be the halo vehicle for efficiency at Toyota and many consumers will buy it for that reason, as they did with the previous version. 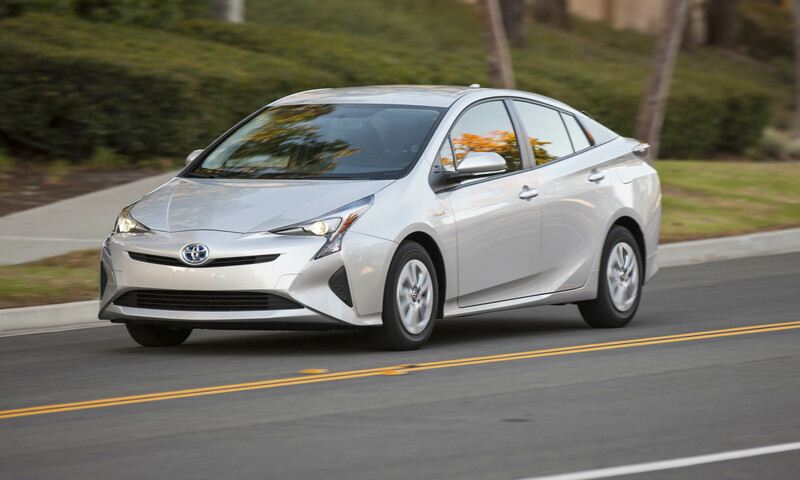 However, if you are looking for one of the most fuel-efficient vehicles on the market and don’t want to sacrifice style, interior space or drivability, for the first time the Prius may be the car for you. A short drive certainly changed the way we think about the Prius — you may end up a convert as well. 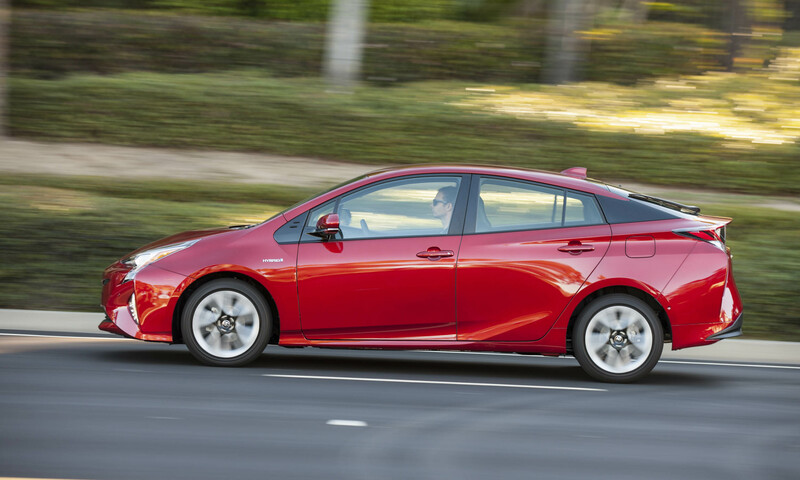 Bottom Line: Toyota makes a Prius that will appeal to more than just the ultra-fuel-conscious. 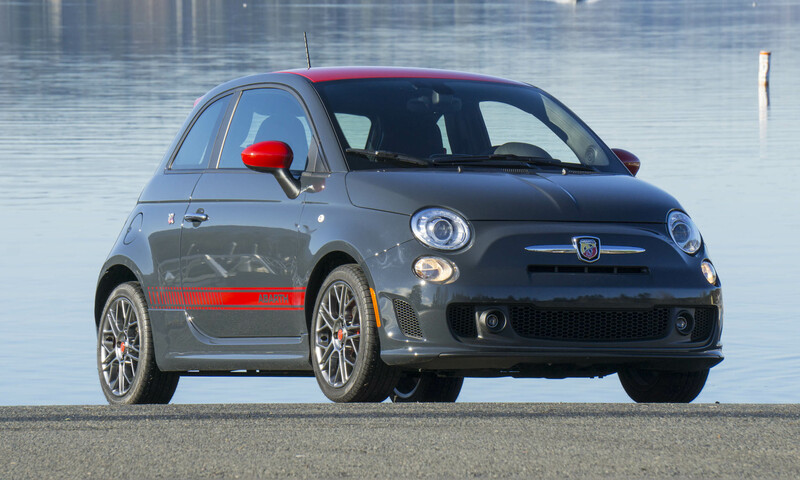 Pros: Outstanding fuel economy; comfortable interior; improved handling. Cons: Odd gearshift; accident avoidance only at low speeds. 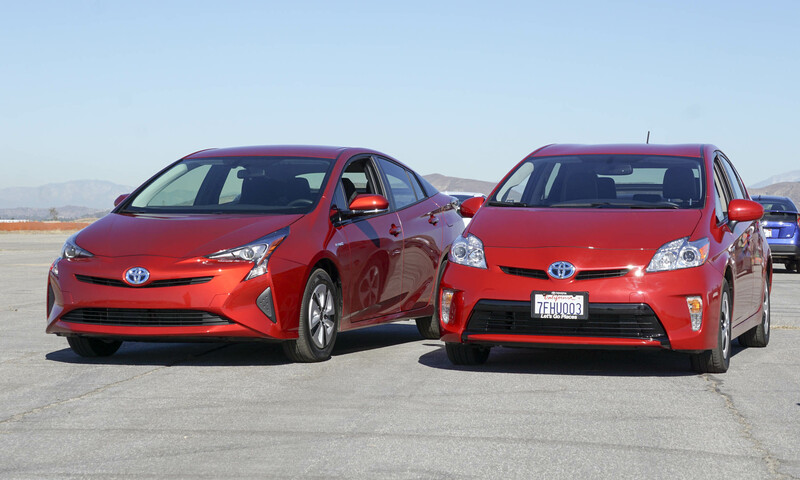 2016 Toyota Prius on the left, 2015 Toyota Prius on the right.